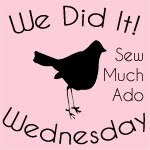 Two blog entries in one day! Can you believe it? 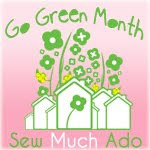 Sew Much Ado is participating in Go Green Month that is all about repurposing things in a crafty way. There are tutorials, pictures and I am sure we will all find new blogs to follow and lots of ideas to try. A while back I made dresses from pillowcases for the orphans in Haiti. This was right after the big earthquake. I have shared it on We Did It! Wednesday as my green project. I am number 48 so far. It should be fun looking at all the things others have made. Check it out! Due to my extreme ignorance in placing this as a button on my blog, it probably doesn't link back to the blog I borrowed it from. I tried to figure it out, but copy and paste is all I came up with. I am a beginner blogger, so your tips are welcome! Let me know if you have shared your own project there after reading this post!